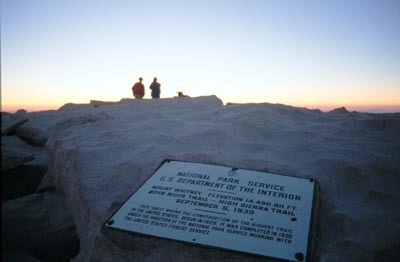 Climb the highest peak in the lower 48 states Mt. Whitney, CA (14,495'), but first warm up on the highest point in Arizona, Humphreys Peak, AZ (12,633'). None available online for this trip. A lot of driving in a short amount of time paid off greatly as we had an enjoyable and successful trip climbing both of these peaks. 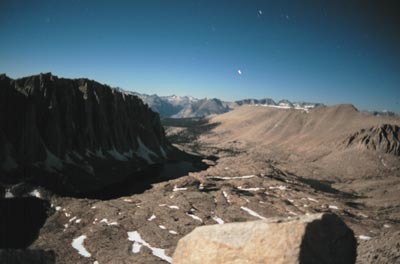 We summitted Mount Whitney under a full moon. The heat and the mosquitos are terrible at this time of year. Glissading should not be performed for the first time wearing a 50lb pack. We left Los Alamos at 4:30 en route to Flagstaff, AZ to camp in the Coconino National Forest and hike Humpheys Peak the following day. We arrived at Flagstaff around 11:30. Our drive had been uneventful save the gawdy fake animals and people adorning the cliffs as you enter the state of Arizona from the east on I-40. We passed the turn off to Meteor Crater on the way and vowed to see it on the way home. We didn't get to see it on the way home but more on that later. We awoke at 7 a.m., drove to the nearest gas station to fill our water bottles and grab a frozen burrito for breakfast. Erica opted for something a little less "gut-bomb-like" and we started the very short drive up to Arizona Snowbowl ski area (14 miles or so out of Flagstaff). 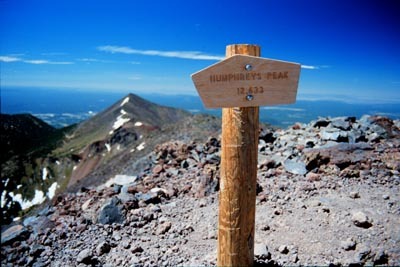 The trailhead for Humphreys Peak starts from the lower parking lot at the ski area. It was going to be a warm day we could tell already. We started hiking at 9:30 am ready to tackle the four miles and 3,300 ft. elevation gain. The hike starts by crossing a ski slope. 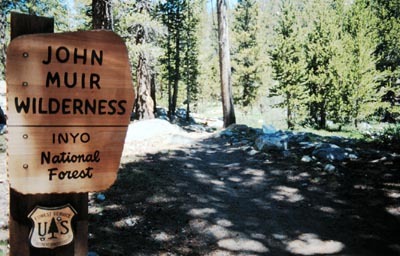 The trail is in good condition and reaches treeline at about 11,100 feet. Once we reached the 11,800 ft. saddle between Humphreys Peak and Agassiz Peak we were getting chilled by a strong, steady wind of 15-20 MPH. The day was warm but we were chilled by the constant wind. We donned our rain jackets and continued up the rocky, steep trail to the summit. We reached the summit in two and half hours. Humphrey's offers a great view of northern Arizona including a view to the Grand Canyon 50 miles to the north. We took some photos, ate and headed down in the strong winds. The sky was partly cloudy but still a beautiful day. It took us the same amount of time to descend the trail as it took us to ascend the trail because of heavy usage. We would walk five minutes, step aside for an upcoming party, repeat. Very busy trail. All in all, it took us a little over five hours to make the roundtrip hike. We went into Flagstaff, watched the Adam Sandler movie, Big Daddy, and continued our drive towards Lone Pine, CA and the Cottonwood Lakes Trailhead. Six hours later We were too bushed to continue driving so we found a desert road north of Barstow, CA and camped. The moon was nearing full and illuminated the desert making for a nice sight. We completed the drive to Lone Pine by 9:30 am. I stopped at Carl's Jr. for my last bit of good 'ol greasy fast food for a few days and consumed a breakfast crossiant with bacon. Erica had tater tots and OJ. Full of quality food, we drove the amazing 20 miles of the Horseshoe Meadow Road to the trailhead in the Inyo National Forest. Horseshoe road rises from Lone Pine to the trailhead at 9,000 ft. via some scary switchbacks. The road is paved but rocks and dirt are very prevalent on this road due to its location and terrain. We arrived at the trailhead and started hiking at 10:30 am ready to tackle 42 miles of hiking in the next four days. I had made reservations for this trail back in March. 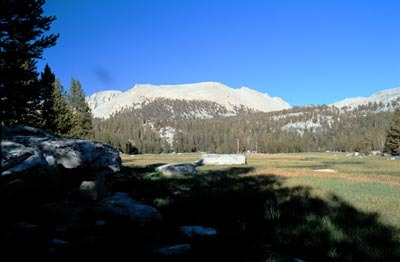 The trails in this area are so popular groups must pay a minimal $4.50 fee per person to hike the trail. 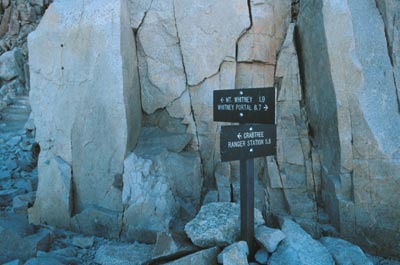 The trails are quota trails and are limited to a certain number of hikers a day. 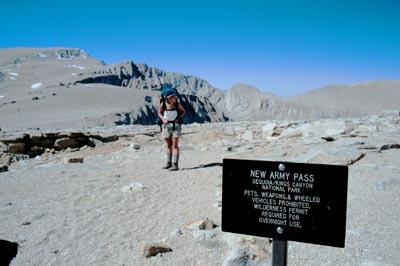 Our goal for the day was to hike 9 miles and cross New Army Pass (11,475). We reached our goal around 6:00 pm after hiking through some very hot desert terrain and setup our first camp. The Cottonwood Lakes were beautiful and teeming with tiny California Brown Trout. New Army Pass was a bit of a hump being so hot and steep. We encountered a short, 20 ft. section of snow at the top of the pass but it was easily negotiated. We had ice axes with us at the word of the ranger station. 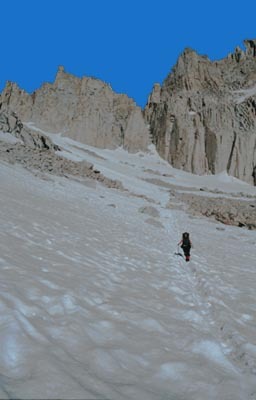 They had said the trails were covered with snow and recommended ice axes and crampons. As it turned out we didn't need them at all. We cooked instant refried beans and chowed on bean burritos. After we feasted, the mosquitos decided it was their turn to gorge themselves. We had bug repellent, Green Ban, (which I highly recommend), but that only kept them from biting. They were still damn annoying. 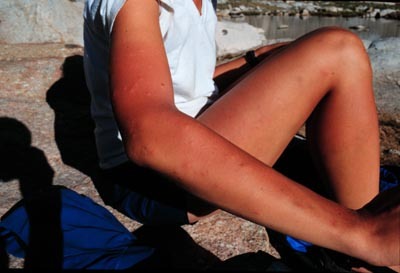 TAKE INSECT REPELLENT! We retreated to the tent early to read and sleep after a long day. Awakening by 8:00am, we layed around for a bit before actually getting up. 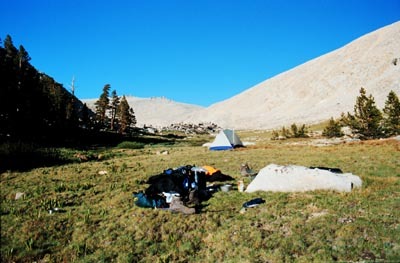 We had plenty of time to reach our next camp, Crabtree Meadow. The 11 mile hike to Crabtree Meadow was going to be tough but we could take our time. 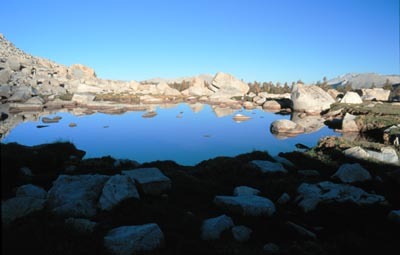 I got up as the sun was just peaking over New Army Pass and took a photo of a little tarn in the sunlight. Before packing up we assessed the damage the mosquitos had inflicted on our bodies the previous night. It was not a pretty sight and, little did we know, was only going to get worse in the next day or two. We packed up and began the descent to Rockwood Patrol Cabin 5 miles away. In a few hours we were there and ready for a break. The cabin, although slightly difficult to find, was a work of art. I found myself wishing I could live there. It is built right next to the raging stream, has a propane stove on the front porch, solar panels for power and a nice peaceful porch overlooking the stream. It was here Erica and I decided to take a dip in the stream, cool off and clean up a bit. Cold but refreshed we started on the remaining 6.7 miles to Crabtree Meadow. This was another hump coming out of the valley up to Guyot Flat. 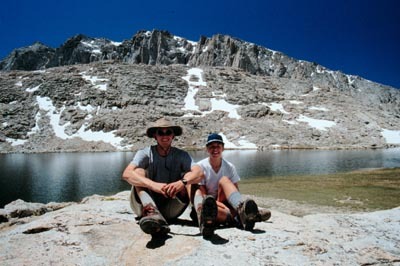 Hot and desert terrain kept us sweating and dreaming of the high mountain lakes we would find near Crabtree Meadow. 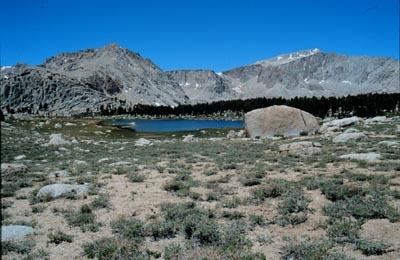 Since passing the Cottonwood Lakes we had not seen anyone else on the trail. Once we reached Crabtree Meadow that all changed. As we hiked up to the meadow, 9 hours since leaving our camp near New Army Pass, we could see that we were no longer alone. Large groups were camped all along the meadow. We opted for a nice, open campsite right above a raging waterfall. We again dipped into the river, ate, explored the meadow area and settled in for the evening by reading some more. During our exploring we had a met a group of seven teenagers and two adults out on a church group hike from Utah. After talking to them we discovered they had the same plans as us--Hike to Guitar lake the next day, get to bed early and ascend Mt. Whitney by the light of the full moon. Although never spoken, it was apparent we would awaken a bit earlier in hopes of summiting Mt. Whitney before this large group of nice folks. We relaxed under the completely clear sky and pondered the fact that we had not seen a single cloud since Kingman, AZ. Hot, dry and clear. These conditions, coupled with a lack of mosquitos near the river, allowed us a great night's sleep out under the stars listening to the constant white noise of the waterfall. We slept very well that night. We took our time in getting up and packing up for the hike on this day was only a mere 6 miles to Guitar Lake. 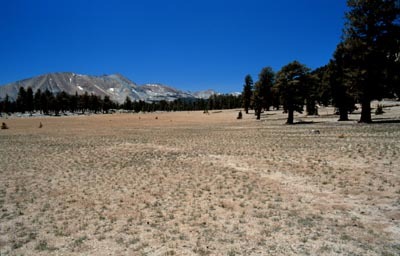 By the time we had set out for Guitar Lake, the others in the meadow had already left. We hoped for a good campsite despite being last to leave the meadow. By 10:30 am we were nearing Guitar Lake. We came around a corner to see a lone pack sitting on the trail with no one around. We heard the voice of the pack's owner from behind us. A friendly chap named Stuart was the owner of the pack. Stuart was from London visiting the states for a few weeks. 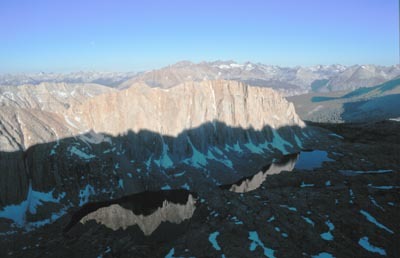 He had started from Kings Canyon National Park and was working on a 72 mile hike culminating in the summitting of Mt. Whitney. He was a very nice guy and kept us company the remainder of the hike to Guitar Lake. At Guitar Lake we chatted a bit more. Stuart was going to camp there and we planned to go a bit higher, to Hitchcock Lakes, so we could have a head start on the Utah clan. We found a nice shelterd spot above treeline at about 12,000 ft for camping that night. After unloading our packs we took the short jaunt down to Hitchcock Lake and once again, swam and bathed. The temperature was an amazing 80 degrees so the icy cold water felt quite nice. (Still a little too cold to sustain long swims though!) Erica was the brave one and completely submerged herself in the lake. I opted for the whimpier wade into the waist and dip the head maneuver. We rested and enjoyed a very lazy afternoon by the lake. This lake was perhaps the most beautiful high lake I have ever seen. Framed by steep, rocky cliffs on the south side and a wide open view of the sky on the west and north side, it was extremely picturesque. Three hours later we decided to head back up to camp and hit the sack for our early 1:30 am awakening the next day. Once again, we were able to sleep out under the stars and the bright moon. The watch alarm sounded at 1:30 am. 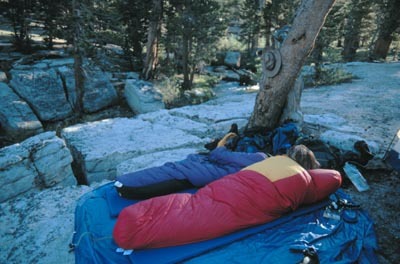 I had slept a fairly restless night in anticipation of the summit of Mt. Whitney. We coaxed ourselves out of our nice warm sleeping bags and packed up to hit the trail by 2:00 am. The moon was bright--really bright! It was brighter than any moon I had ever seen. We could look at it but not for too long as it was too bright to stare at. A white sun. This made for great trail illumination and route finding which was nice. After about 45 minutes of hiking we looked down and noticed a bunch of aqua-green lights bobbing up and down. It was the Utah group. They had awakened 10 minutes after us. We knew this because they set off a firecracker that echoed like nobody's business through the basin shortly after we had awakened. On the very steep switchbacks up the west side of Mt. Whitney I stopped for a two minute time exposure at f2.8. This photo turned out wonderful, making night look like day. It was a couple hours before we made it to Trail Crest. From Trail Crest it was another 1.9 miles to the summit. The Utah group was gaining on us. 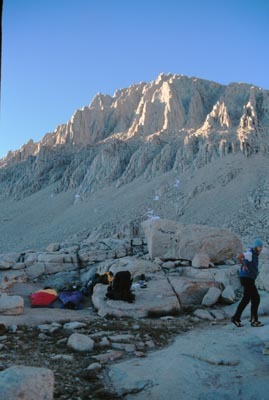 We left our packs here since we would be coming back to this point before dropping off the east side of Whitney back to the Whitney Portal. But now, we had another 1.9 miles to the summit! We grabbed our daypacks and headed up trying to beat the sunrise. There was a couple spots of kinda spooky exposure that was made a bit more scary by the moonlight. One hour later we were there! The sky was full of pastel colors as the sun began to peek out over Death Valley. It was windy, damn windy, and cold on the summit. Erica and I had parkas, mittens and hats but the gang of Utah hikers were in pullover sweatshirts and jeans and freezing big time! They found shelter in the summit cabin while Erica and I braved it out sitting peacefully watching the sunrise. Many photographs were snapped, the register signed and food consumed before we headed back down the mountain an hour after we had reached the summit. We still had another 11 miles to go to reach the Whitney Portal trailhead. By this time I was craving the greasy fast food of Carl's Jr. or Dennys. (On the drive out we passed numerous Dennys' and it had me thinking about an omelette with bacon the greater part of the trip!) The cuisine the past few days had consisted of freeze dried meals and trail mix. I put thoughts of food aside, we were still 9 miles from the trailhead and then we were going to have to hitchhike to get back to where my truck was, so greasy food was many hours away. We prepared to lug our 50 pound packs down the notorious two miles of switchbacks from trailcrest down the steep section. However, it was then that we spied a 300 foot long section of snow perfect for glissading down. We had lugged the ice axes over 28 miles of trail and damned if we weren't going to make good use of them now. We donned our outerwear, secured the packs to our backs and went sliding. This was not only fun but saved our knees from two miles of hard impact. The remaining seven miles was hot and painful on the knees and feet and I was glad to see the parking lot by 1:30pm. After coming down the Whitney Portal trailhead I couldn't believe people were hiking up it! It's a steep and hot trail and perhaps I was a bit biased after hiking 30 some miles. When we reached the portal trailhead we took time to explore the general store full of souveniers and guzzled down all the free-refills-root beer we could drink. The store owner said he was headed down the road in about an hour and we could hitch a ride down with him. We had hiked out with the Utah group and they were in the same boat--they needed a ride to thier van at the Cottonwood Lakes trailhead as well. It was nice to have the company trying to get a ride. The store owner flaked on us so we took matters into our own hands. It wasn't until two hours later that I caught a ride down with a German fellow to the Horseshoe Meadow road turn off. He wasn't able to drive me the remaining 20 miles to my truck. I was now in the desert in 105 degree weather burning up looking for another ride. One of the Utah group's leaders had found a ride to this point as well so we had each other for company while looking for a ride. A couple people stopped but no one was going all the way up. It was looking bleak and I was roasting. About the time I had given up hope for a ride and resigned myself to hiking the remaining 20 miles, Erica and the other Utah group leader pulled up in a bronco with one of California's finest, a CHiP! This particular officer had been living and working in the area for over 20 years and knew his stuff. He was a regular tour guide showing us where movies had been filmed and where cars had driven off the Horseshoe Meadow road. Quite the gentleman and friendly officer. We reached the truck and were relieved to be back but very excited about the trip we had just completed! It was one of the best backpacking trips I have ever been on. Beautiful country, nice weather and the highest peak in the lower 48 states, I was elated. We were exhausted, dirty and hungry. Where could we go to get cleaned up and have some fun? Magic Mountain was the winner! We drove the 270 miles to Valencia, CA that afternoon, got a hotel room, cleaned up, and went to feast at Applebees! The next day was a bit of culture shock going from the complete solitude of the sierra wilderness to total inundation of people. We enjoyed ourselves none the less. We rode all the great coasters until 6 pm when we began our drive home. We pushed hard to reach Flagstaff by 2:30 am and camped where we had camped on the way out to California. On Friday we continued the drive home, stopping at Meteor Crater to satisfy our curiosity about this wonder. When we arrived we learned it was eight dollars a person just to view the crater. We were short on cash and wanted to eat at the Cracker Barrell in Gallup, NM, so we opted not to pay. We had spied a dirt road on the way in and hoped we could drive that out a bit and hike to the crater from there. Turns out they have a security guard patrolling this road and he won't allow you to hike out from your vehicle. We didn't get to see the crater. The rest of the drive went smoothly and we arrived in Los Alamos by 5 pm in time for the fourth of july weekend. 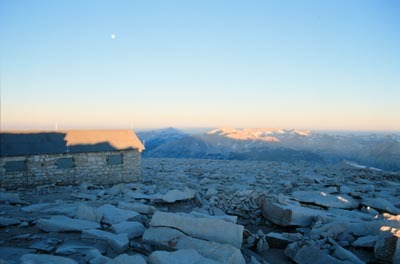 A panorama photo from the summit of Mt. Whitney. Written by Jason Halladay on 14 July 1999.